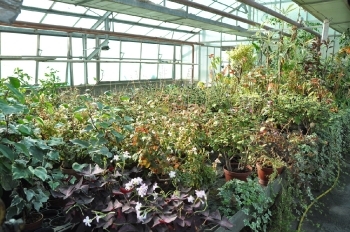 Are you curious to have a look inside of Monet’s greenhouse, that is not open to the public? I was! With the allowance of the gardener, I took this picture last July. 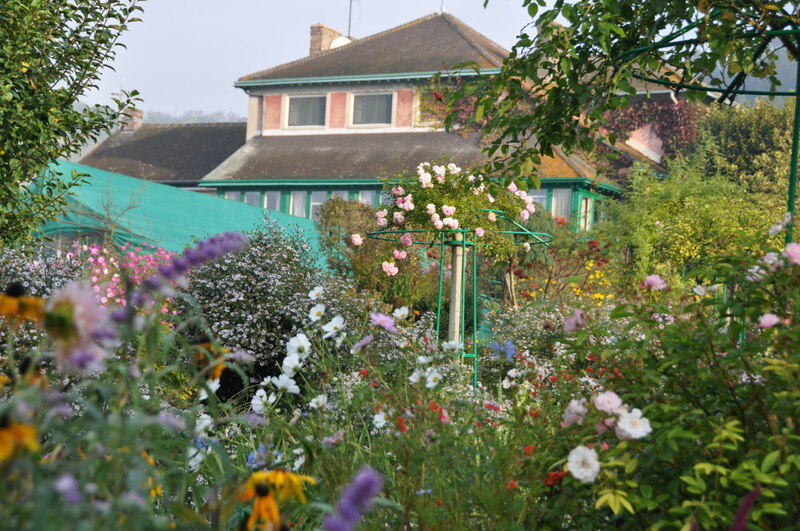 Monet was such a keen gardener that he built a greenhouse on the location of this one, on the left side of the flower garden. It was heated, and the painter cultivated orchids and exotic ferns. 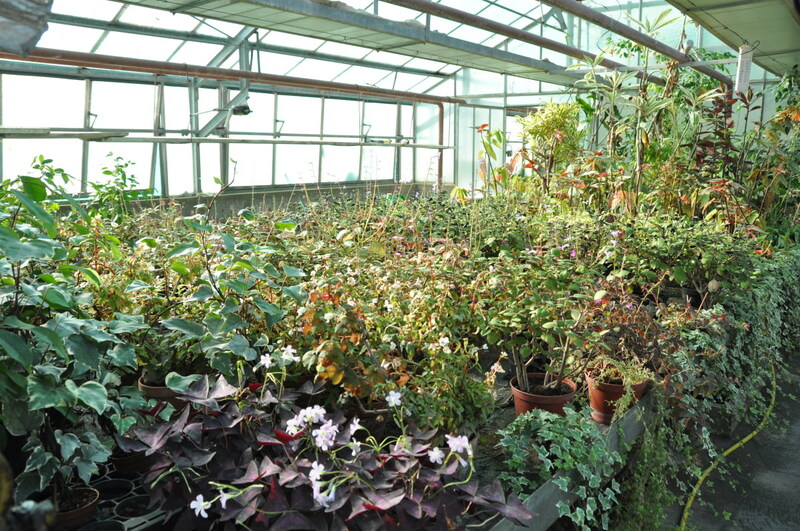 He also grew his seedlings in the greenhouse. In front of his second studio, a pink house he built in 1899 on the corner of his estate, Monet designed a colorful area of parallel flower beds. In October, the tall flowers of late season mix their pinks, blues, yellows, oranges and reds and their different textures ans shapes, creating a living painting that moves in the breeze. Sages, dahlias, asters, cosmos, roses, black eyed Susan, tithonias are all enchanting September and October. 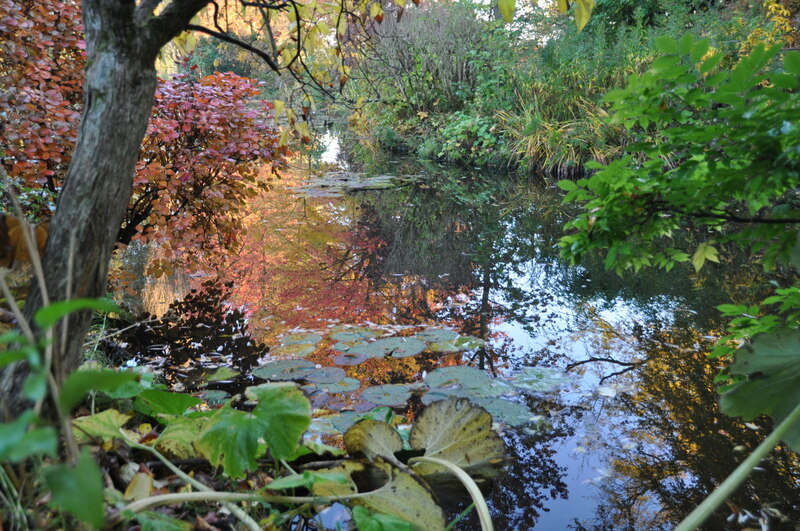 This is how Monet’s pond looks on November 1st, minutes before closing for the winter. Soft or spectacular, according to sunshine. Monet was 76 when he decided he needed a new studio. This one is actually the third one he built on the premises. After having turned a former barn with western light into his first studio, errected the second one with a big window on the northern facade, Monet decided he wanted the light to fall from the sky, and not from any other direction. This is why the third studio has huge skylights. The entire roof is made out of glass. The misty days of October are back! 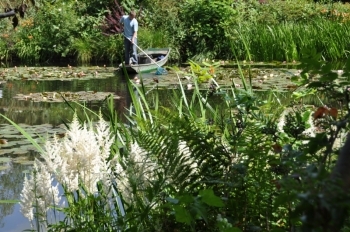 On Monet’s pond at Giverny, they create a soft atmosphere enhancing the different textures of the foliages. Among all these greens, the sumac of Virginia flames. Asters fill in the flower beds in big bouquets. The boat awaits the gardener. He will soon arrive to maintain the pond. Autumn leaves fall on Claude Monet’s pond at Giverny, creating new beauties, new color harmonies. A look through the window of Monet’s studio, on the ground floor of his house at Giverny. 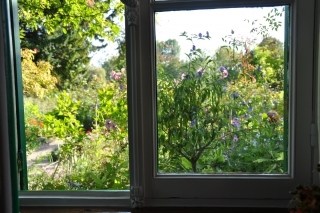 The garden appears like an additional painting among the canvases hanging on the wall. 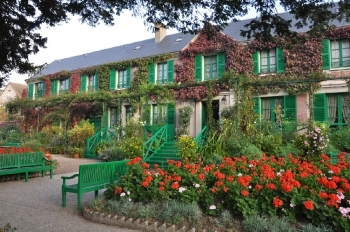 The beauty of September in Monet’s garden at Giverny lies in the bright colors displayed by giant flowers. Pink or red huge dahlias, tall yellow helianthus, enormous purple asters, supersized yellow or brown sunflowers have now reached their final height. In the main alley, nasturtiums flow like a river on the sloping ground, pretending to fill the pond of the water garden. Their petals shimmer in the sunshine, just like paint on an impressionist canvas. Summer is a gorgeous time in the gardens, especially at Giverny. While water lilies are at their best, the flower garden offers an explosion of colors. Dahlias in every shapes and shades show their heads among the light butterfly like gauras, phlox and lavenders spread their scents, gladiolis bent graciously over the alleys, surrounded by sages and verbenas. The list of blooming flowers is endless. Instead of carpeting the ground like in spring, summer flowers stand, tall, imposing and delicate at the same time, offering another experience of the garden. 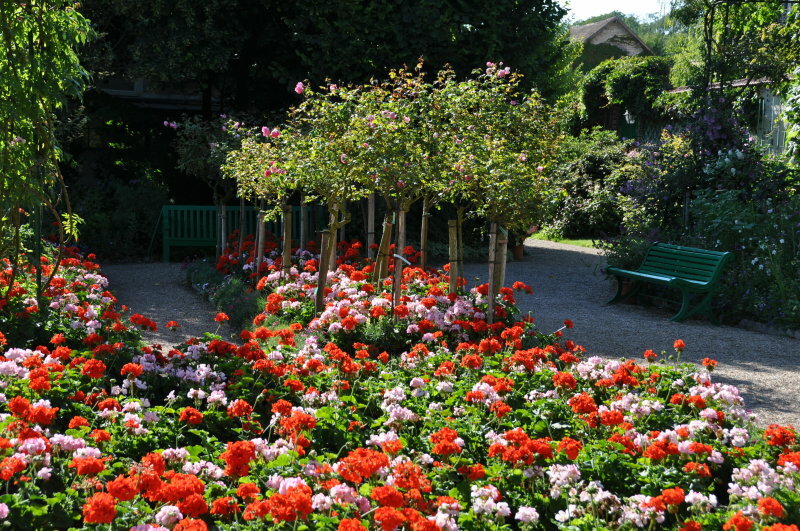 This is one of the most impressive flower beds at Giverny: a vibrant combination of pink and red pelargoniums displayed on oval patterns, just in front of Claude Monet’s house. They look very much like carpets of flowers at the foot of the facade. Pelargoniums, known until recently as geraniums, are the most popular Summer flowers in France. They were my grand mother’s favorite on her windows. No wonder, they are so resistant, easy to grow, long flowering and colorful! Pelargoniums are commonly used in pots, it is a nice change to plant them in the garden where their rich tones flame in sunny spots. 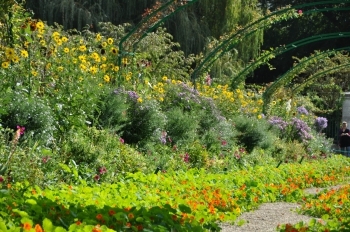 In Monet’s gardens, they make their come back every year in May just after the last tulips. 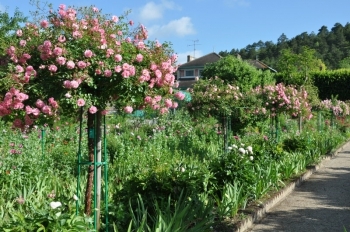 According to the mood of the gardener, they are planted either by color – an entirely red border and a fully pink one side by side – or mixed like this year. I prefer the latter option. It looks less formal, and more ‘painted’. 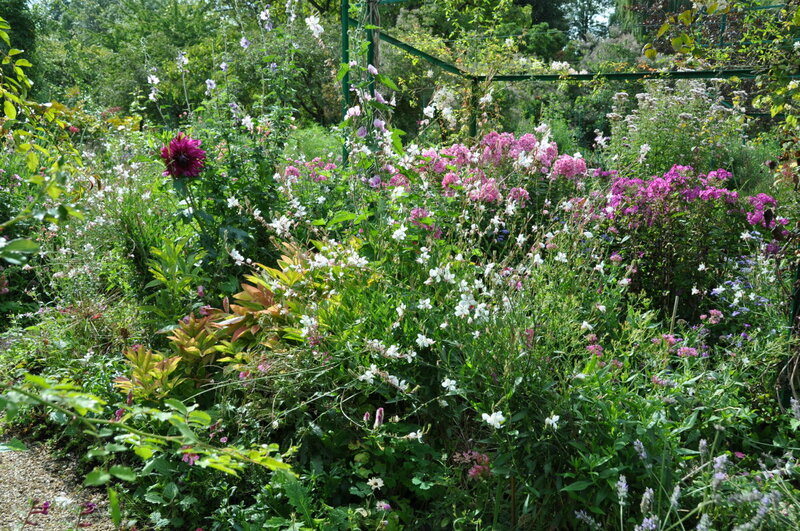 A border of pelargoniums in Monet’s garden? It doesn’t sound very exciting. Actually, it is daring. 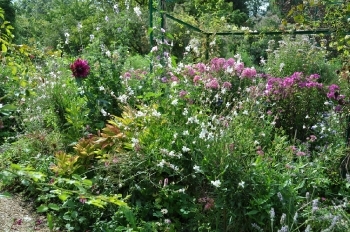 This red and pink carpet surprises many visitors, astonished to encounter such a low and formal flower bed at last, after so many unusual, overgrown mixed borders. The explanation is the need of contrast. In late Summer, when huge flowers overwhelm visitors meandering along, it is nice to have a corner where you can breath, see in the distance. After the wood, the clearance. 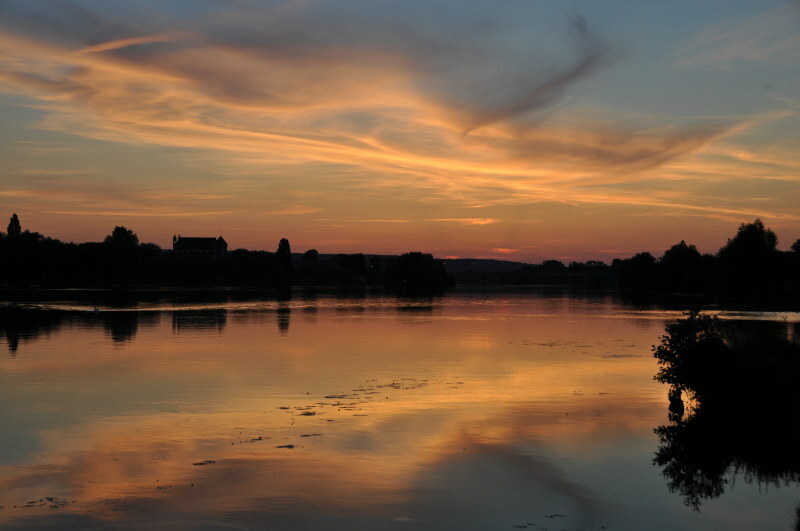 Contrast, one of Monet’s favorite painting trick. 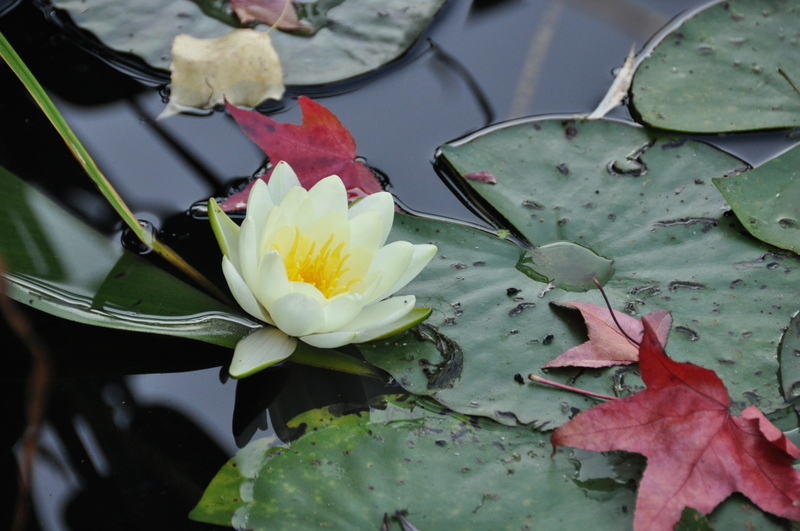 Water lilies are sensitive to cold. When the night is overcast and mild, they are all open in the morning. But if the night is clear, they close and need several hours of sunshine to open again. They like a warm water not only to open, but also to bloom. 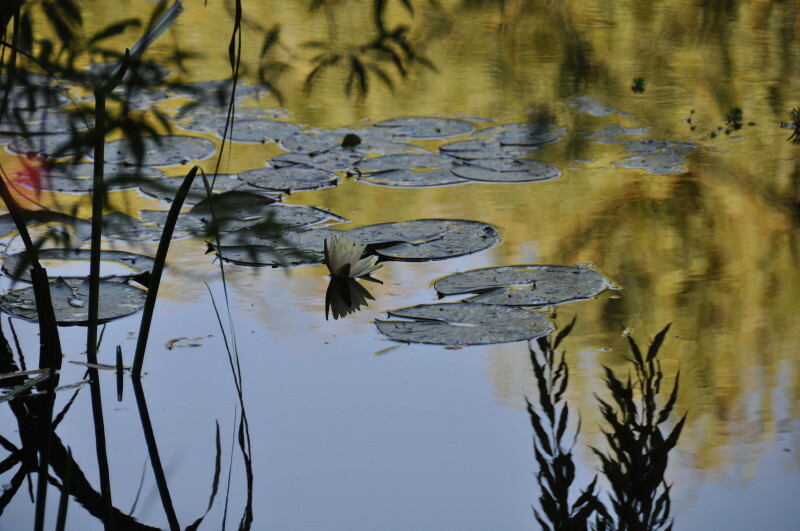 On Monet’s pond, water lilies are gorgeous during heat waves, they become scarce during rainy and cool periods. This is true for a big pond like Giverny. 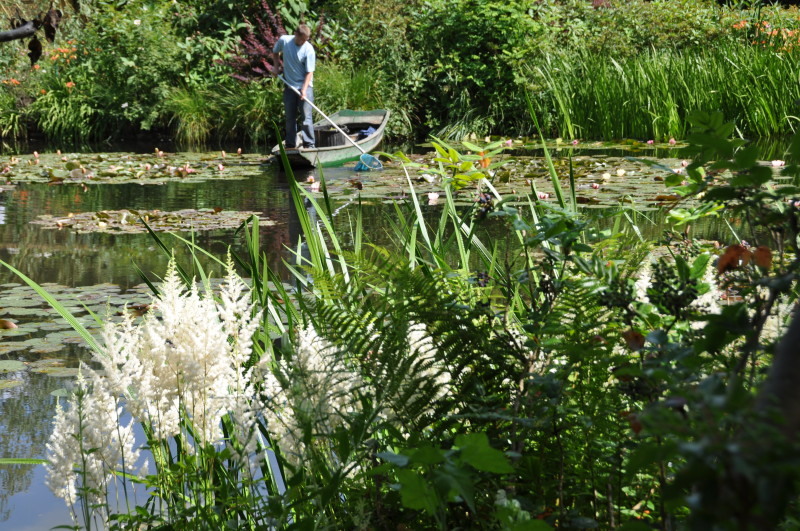 For gardeners who would like to grow water lilies in a wash basin, it is wise to look for a partly shaded spot. In direct sunshine, the water of a small container becomes very warm. If some like it hot, it is not the case of water lilies. 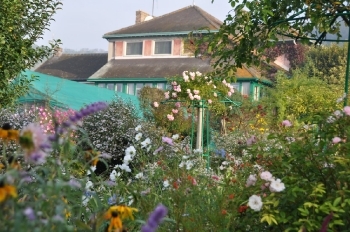 Monet’s Garden at Giverny is not a low maintainance garden. In the 19th Century, having gardeners and helpers was not as expensive as today. 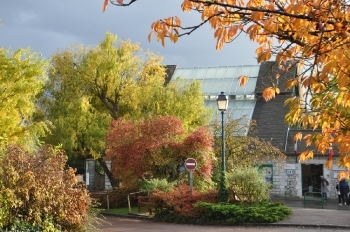 The wealthy painter could afford up to six full time gardeners to manucure his 5 acre garden. 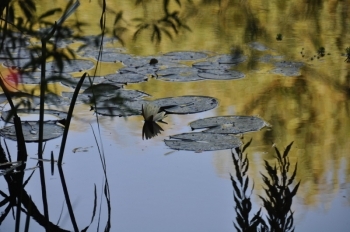 One of the heavy task of his times that is still a daily core today was the skimming of the pond to take out all the dried leaves or petals floating on the surface. 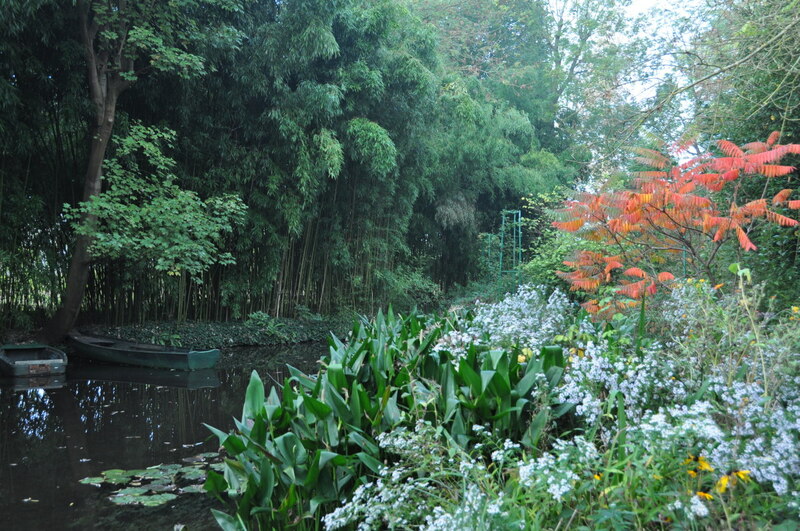 The pond being surrounded by trees and flowers, it is the only way to keep the water clear. The job takes two hours and must be done almost every day.